A Boat is a vehicle entity used for transporting the player across water. While on a boat the player has the ability to use movement controls to steer it in any given direction. The boat can be attacked which will make it drop back into item form. Hitting the boat with other objects can turn it into three Stick and two Oak Wooden Plank. Besides transportation, boats are also able to be used as a fuel source for Furnaces. The way to obtain an oak boat is to by using its crafting recipe. The ingredient needed in the recipe is 5 Oak Wooden Plank. Oak wooden plank can be crafted from oak wood dropped by chopping down trees. 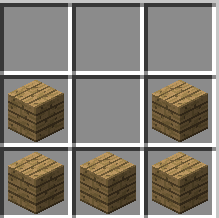 Once you have 5 wooden planks the next step is to arrange them following the pattern below into a 3×3 crafting grid. 3 planks line the bottom row of the grid while the remaining two fill the left and right sides of the middle row. Oak boats cannot be used as ingredients to other recipes however you can use other types of wooden planks to make different color boats. Here is a list of the other boat you can make.